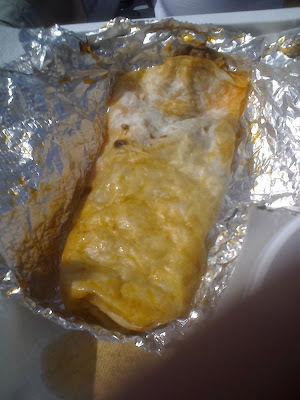 The Other Side of Spartan Sports: A New Victory Burrito? It was a beautiful day for football at Spartan Stadium. The sun was shining, the air was warm, and the Spartans were up 28 points at halftime. So it was time to try out the new Mexican option at the stadium. First off, the option resides behind the south endzone, so I had to make the long journey from section six. This takes a while during the halftime rush. When I reached the stand I saw that I could immediately place my order. I should have taken this as a bad sign as everywhere else had long lines. However I took my beef burrito and drink and booked back to my seat only to emerge into the stands right as kick off occurred. "In 1997 on the campus of Michigan State University, two friends Ruben De Los Rios and James Espinoza, began selling burritos every Sunday to the poor and hungry students of Rather Hall Dormitory. What began as a hobby and service to fellow students soon turned into an expanding business as customers lined up in Rather hall, establishing Maria's Tacos. When Michigan State University student organizations caught word of Maria's Tacos, the duo began catering for ethnic events and the operation was then in full swing!" Yes, it was founded in a dorm room in the Brody Complex, and it tastes like it too. The cheese is of low quality, the beef is of low quality and obviously the only seasoning used are those packets of taco mix that you buy at the store. So basically this was a meal that could have been cooked up in any dorm room on a hot plate. The only difference is that I know that in the directions of those little packets of taco mix they instruct you to drain the grease before serving the meat. So, it looks like the search for a Victory Burrito in Spartan Stadium may be continuing. Our suggestion for now may be to visit Pancheros on Grand River before the game, and bring a burrito with you over to the game. Perhaps though, Maria's Tacos suffered some first game jitters, and they will be putting out a better product in future weeks. If you try one of these out next weekend, or already have, please let us know what you think! 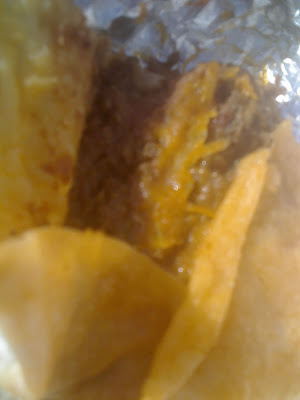 Sadly, I had the three taco meal on Saturday. I remembered that there was a Coney Island kiosk at the south end of the stadium (there isn't any longer) and once I got down there, I wasn't going to settle for a regular old bratwurst. I should have settled. That Coney Island was awesome, a footlong chili dog for $4 was the best deal in the stadium.